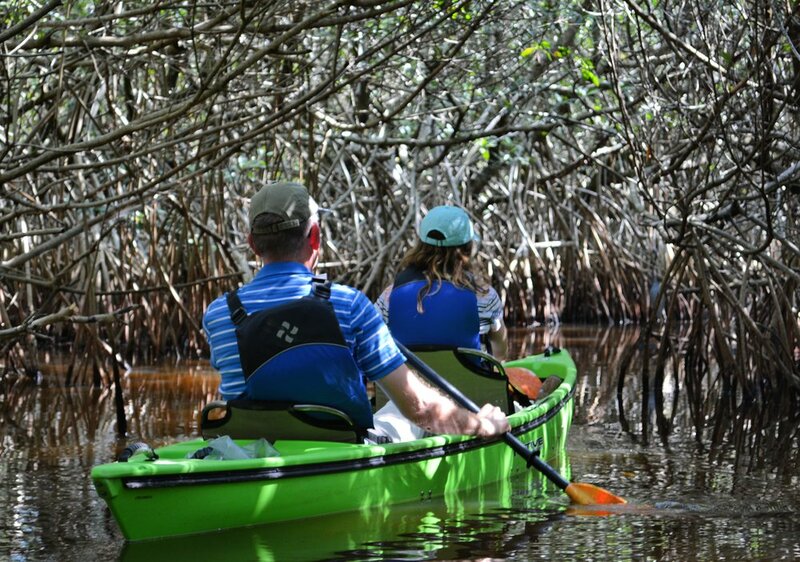 Join us on our mangrove maze adventure on our very comfortable and stable kayaks with our biologist guides. If you are looking to get away from the crowded beach, get some sun or exercise or take a break from a conference then this is a great adventure that is a quick drive 10 minute drive or uber from Marco Island. On this tour we often ospreys diving for fish, pelicans flying of head, marine life on the mudflats, mangrove mazes and tunnels, and much more. On some days we see dolphins or a possible manatee but this is not every day and doesn’t happen often. Our biologist/naturalist guides will teach everyone how to paddling thru tidal areas that require more strength and maneuvering on some days. We believe this a really fun way to get some sun and exercise while on vacation paddling thru these mangrove mazes in SouthWest Florida. All of our guides are certified guides in Everglades and Yellowstone National Park, Big Cypress Preserve, and Grand Tetons National Park.